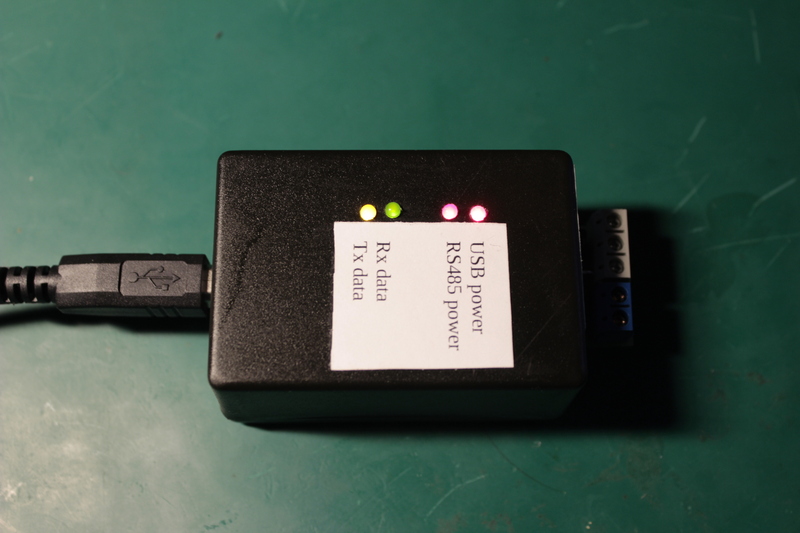 RS-485 is not a protocol; it’s simply an electrical interface. Although many applications use RS-485 signal levels, the speed, format, and protocol of the data transmission is not specified by RS-485. This line transmits digital information between multiple locations. Data rates can be up to, and sometimes greater than, 10Mbps. RS-485 is designed to transmit this information over significant lengths, and 1000 meters are well within its capability. The distance and the data rate with which RS-485 can be successfully used depend a great deal on the wiring of the system. You can read more about RS485 networks and wiring at this great article from Maxim. 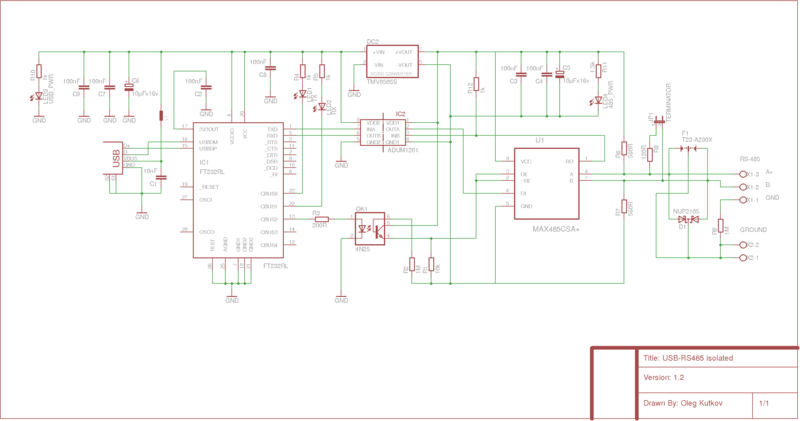 It’s very easy to convert RS485 line to the unbalanced uart interface using special IC. Many vendors provides different solution with different prices. As usual, most simplest solutions is pin-to pin compatible and can be easely replaced. In my projects I’m using ADM485 and MAX485 which is quite identical. Both chips is very low cost, easy to use and easy to solder. 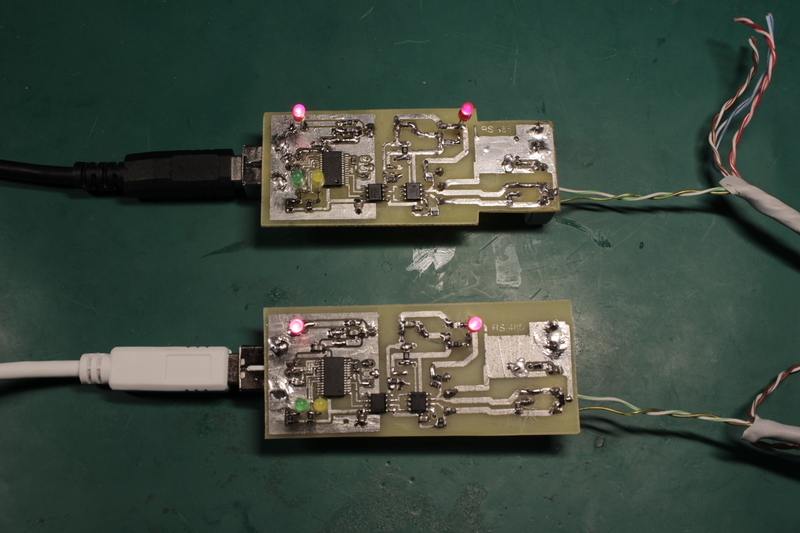 This devices are half-duplex transceivers so you need to manipulate I/O states using 2 and 3 pins of the chip. Pin 2 (RE) – Receiver Output Enable. A low level enables the receiver output, RO. A high level places it in a high impedance state. RX state. Pin 3 (DE) – Driver Output Enable. A high level enables the driver differ ential outputs, A and B. A low level places it in a high impedance state. TX state. USB and isolation part is identical to my eqmod adapter. FT232 + ADUM1201 is the best choice. 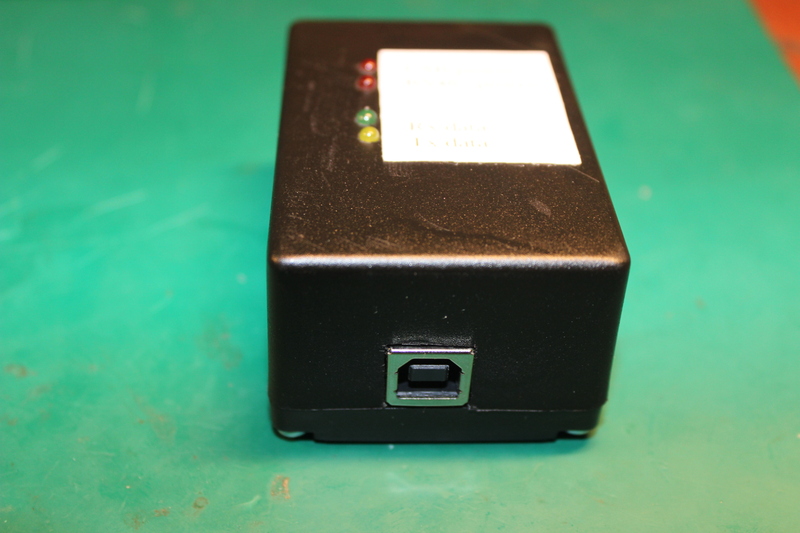 Second part of the ADM1201 is connecting directly to the 485 chip. What about powering of the isolated part? There are very good solutions on the market. For example – DC-DC converters from Traco power, like TMV0505S. This converter is 5v input and stable 5v output which can provide isolation up to 3000 volts DC. 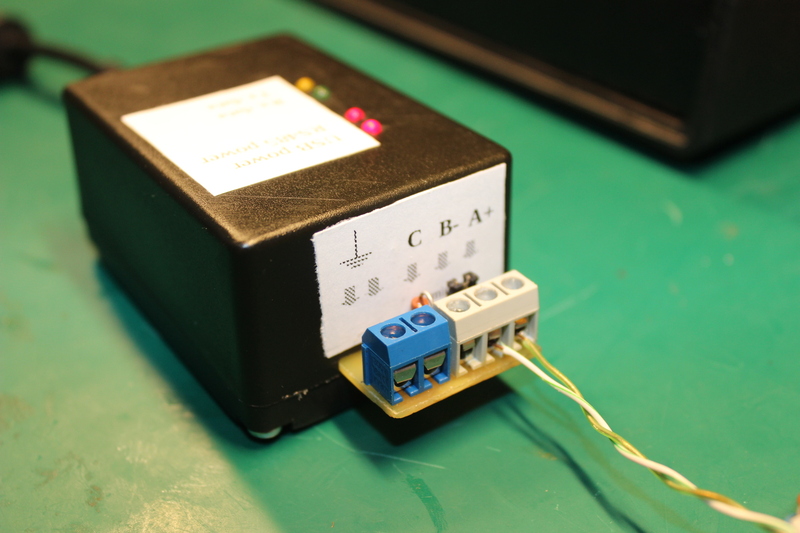 Transceiver state can be switched using high-speed optocoupler. Here is schematic of the device. As you can see left part of the schematic is almost identical to the eqmod schematic, please refer previous article for details. OK1 4N25 is high-speed optocoupler used to driver 2 and 3 pins of the MAX/ADM485. 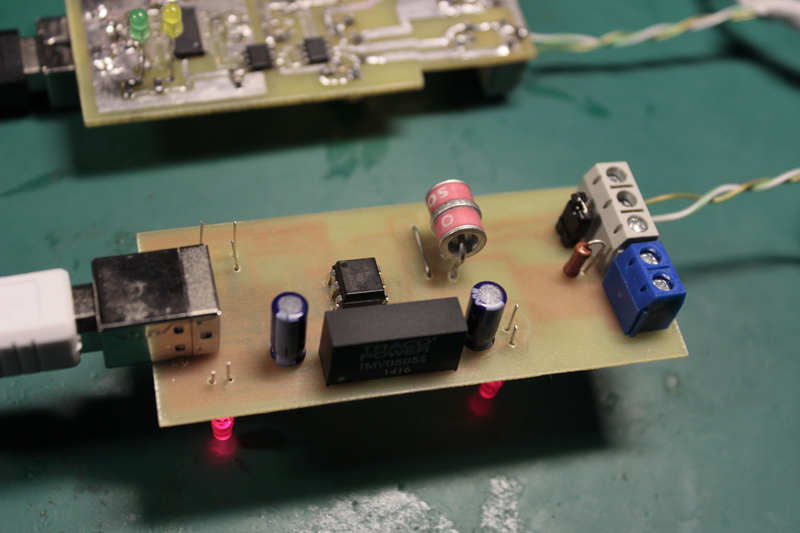 Photodiode is controlled by CBUS2 of the FT232. Please check the FT232 datasheet, section “3.5 CBUS Signal Options”. Resistor R2 is used to stabilize phototransistor and avoid false positives of the optocoupler. D1 NUP2105 is protection diodes designed for RS485/CAN buses. This diodes can protect networks from ESD and other harmful transient voltage events. F1 is arrestors from Epcos and can help to protect device from the larger voltage spikes. Of course this device should be properly grounded via X2-1 and X2-2 terminal. Without grounding all protection circuits is useless. R8 is optional termination resistor which can be disconnected by the JP1 jumper. This resistor should be connected if this adapter is placed on the line ending point. X1-1 is a common terminal and can be connected to the free pairs of your cable (in case of usage standard ethernet cable). This line is grounded via 1M resistor to avoid strong currents due to antenna effect of the wires. Proposed PCB layout, single layer board.